Moto 360, Apple iWatch: Is it time to buy a smartwatch? Motorola’s Moto 360, seen above at a conference in June, sold out online in under three hours. That’s good news for Apple, which is expected to announce its iWatch this week. For years now, the companies that make billions of dollars selling us smartphones have been working feverishly to figure out what sort of pricey gadget they can sell us next. They’ve experimented with smart glasses, virtual-reality headsets, and even smart socks. But gradually, one by one, they appear to have reached a consensus that the best place for us all to put our next tiny mobile computers is on our wrists. Having arrived at this conclusion, these companies—Samsung, Sony, Apple, Microsoft, Nokia, LG, and many more—are pressing ahead despite a distinct dearth of enthusiasm on the part of the gadget-buying public. 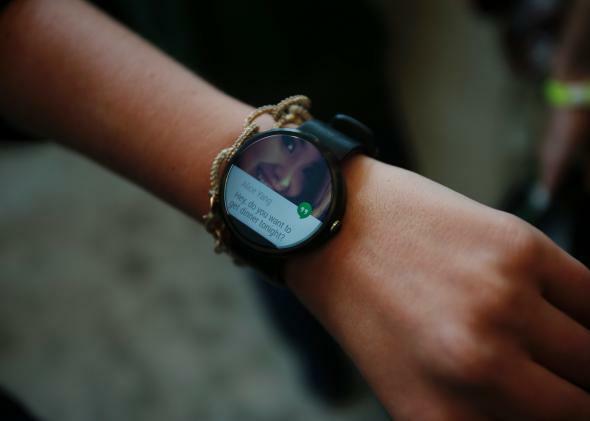 Analysts estimate that fewer than 2 million smartwatches were sold worldwide in 2013, despite splashy marketing campaigns by Samsung and plenty of hype for upstart Pebble. That’s not surprising when you consider that surveys found just one in five U.S. consumers had any interest in buying one. What’s not yet clear is whether the problem with smartwatches is the concept or the execution. It could be that most people simply don’t want or need a second mobile computer, in which case all the cute kids in Star Wars costumes in the world won’t do much to boost sales. But it also may simply be that no one has yet built a half-decent one. Samsung has released six smartwatches in the past year alone, and not one has drawn raves. There are signs, however, that the industry may finally be figuring out what works—and, at the same time, that the public’s resistance to the tech world’s shiny new things may be wearing down. The Moto 360’s most impressive feature is that I stopped noticing it almost immediately. Whenever I wear the LG G Watch or the Samsung Gear Live, I’m constantly compelled to fidget with it; there’s this unexplainable feeling of having something alien on my wrist that is there because I need to use it. The 360, on the other hand, just vanished into the spot left on my wrist by the Seiko watch that conveniently died this week. More surprising than the critical plaudits is that the public appears to have greeted the device’s launch with something other than indifference. Less than three hours after the watches went on sale on Motorola.com, the company announced that they were sold out, and that availability might continue to be limited for the foreseeable future “due to high demand.” The watches also appeared to sell out almost immediately on BestBuy.com. But if it is true that people are finally coming around to the idea of getting texts and email notifications on their wrists, that’s great news for Apple. Typically, Apple has been loath to introduce new gadgets until it’s certain that they’ll be greeted with raves and lines snaking out the door. On Tuesday, however, it is expected to make its first genuinely risky new product announcement in years: a flexible-screen wrist computer that links up with the iPhone and has already been popularly dubbed the iWatch. Rumors are that the iWatch may not go on sale until next year. Apple similarly introduced the first iPhone and iPad several months before it was ready to begin selling them. Still, the public reaction to Tuesday’s announcement will be a good indicator of the public’s appetite for high-tech wrist wear. If fanboys and fangirls swoon, you can bet Samsung, Motorola, and the rest will kick their own efforts into high gear. On the other hand, if even Apple’s watch draws yawns, its rivals may start thinking about sending some of their designers back to the mobile-technology drawing board. Apple, meanwhile, is reportedly trying to “set low expectations” for the iWatch’s battery life as its engineers try to wring features like voice control, health monitoring, and mobile payments out of a circuit board the size of a postage stamp. The company is said to be working on wireless charging technology for the device to ease the inconvenience of re-powering it. So is it time for you to buy a smartwatch? For most people, the answer is probably “not yet.” But the enthusiasm for the Motorola launch suggests that the early adopters, at least, are finally ready to bare their wrists and open their wallets. For the companies that are banking their futures on these gadgets, it’s about time.